As I write this, spotty showers are moving through the state. At this time of the year, my interest is where those fronts are moving from. Strong fronts, especially from the southwestern part of the country, pickup and carry winged insects into the Midwest, most notably black cutworm. It is still believed that this pest, of many plants, does not over-winter in the Corn Belt, but rather arrives on these storms and literally “rains” moths. So, every year is a reset with this pest. Black cutworm does not instill fear into corn producers as it did for decades, probably for two main reasons, planting date and seed-applied insecticides. Because black cutworm’s egg hatch and larval development is triggered by heat accumulation (50°F threshold), it takes some time for them to reach the size to damage, and/or cut, corn seedlings. The trend with earlier/more planting and the improved hybrid’s early vigor has likely allowed corn to outgrow any damage. Too, with virtually all corn seed treated with a seed-applied insecticide, there is systemic protection within the corn seedling. Though this translocated insecticide is short-lived, it is enough for early developing black cutworm larvae. It is important to note that this is not true with mid-later developed larvae. Think…black cutworm initially feeding and developing on weeds/cover crops and then shifting to emerging corn after herbicide application. 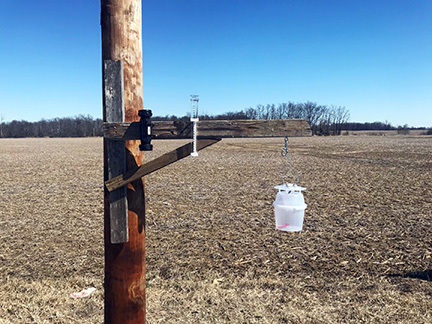 Today, March 28, cooperators throughout the state will place their pheromone traps out and begin to monitor, on a daily basis, for black cutworm. Good timing, as we have rains originating from the southwest and temperatures into the 50’s and 60’s. Timing, and intensity, of moth captures allows us to begin tracking heat unit accumulations and anticipating larval development. A late-planting spring and numerous arriving moths, along with delayed weed/cover crop termination, could set the stage for significant field damage. Will it happen this year? I hope not. But, I sure am grateful to trappers from Posey to St. Joseph Counties that are watching and counting. Look for their report in upcoming issues of the Pest&Crop.